When a client calls and explains that he wants have his wedding in Barcelona and he has been given the task of planning a wedding in Spain for his bride to be, I immediate get excited by the thought of helping the groom with his challenge. Many of us have seen “Here comes the Bride” the reality TV show where a groom has to plan his brides wedding, so I am now in my element as I know that, with my help, this groom will be able to provide his bride with her dream wedding in Barcelona. The wedding needs to be easily accessible from where ever their guests are staying. I explained that the beauty of planning your wedding in Barcelona and working with the Sunshine Weddings Spain team is that this wedding in Spain will be bespoke and tailor made to the bride and grooms requirements. We set to work to find a wedding venue in Barcelona. The groom flew into Barcelona airport and within 25 minutes is in the City centre where we meet to begin the search for a wedding venue in Barcelona. Our groom loves the City and thinks it will be an ideal place for his guests to stay, with an abundance of hotels museums churches shops and restaurants, but what about the sea view wedding venue in Barcelona. 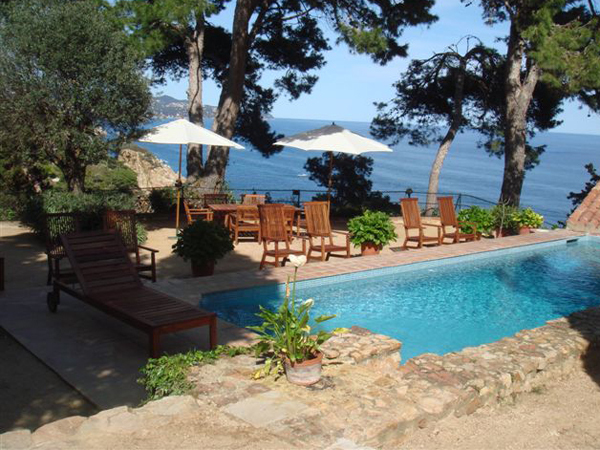 Have no fear this is where we take a scenic drive out of the City just 50 minutes towards the Costa Brava. The drive feels like it takes no time at all, with the glistening Meditteranean sea and stunning Spanish countryside along the way, a lifetime away from the excitement and buzz of the City, such a contrast and what a great way to start off any wedding in Barcelona. I explain we can organize transport for his guests and bride who, like us, will have a great experience in seeing the Barcelona coast along the way. We arrive and are greeted with a stunning sea view and a glimse of the port that sits to the right. What a lovely quaint Spanish fishing village where this sea view wedding venue in Barcelona sits. I show our groom around and we feel like we have been taken back in time. We walk towards the ceremony area and our groom stands looking out to sea imagining this is where his wedding in Barcelona will take place and thinking how his bride will feel walking down the steps of this rustic sea view wedding venue in Barcelona. We stroll around and I explain where the reception will take place alongside the ceremony area overlooking the sea and the dinner in the grand hall of this rustic sea view wedding venue in Barcelona with dancing taking place long into the early hours. Now to start planning the details and help our bride and grooms dream wedding in Barcelona become a reality.